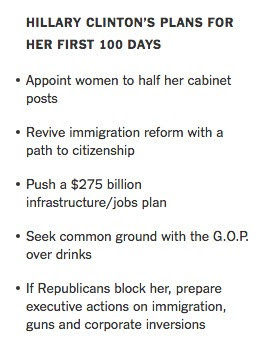 Here's the Nonsense: Hillary's plans for her first 100 days as president look like they could really make some positive changes in Washington. 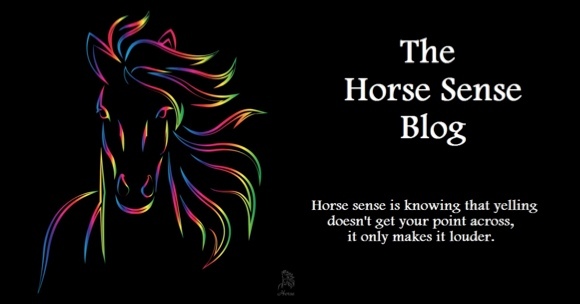 Here's the Horse Sense: Hillary's plans are nothing new and should be a warning to voters that electing her is a huge mistake. Her administration would be more of the same but at higher speed to destroy America. We've talked about the Clintons for decades. Experience with Bill's presidency showed us how much damage he could do, but most of it was thwarted by the strong Republican House of Representatives that reimplemented many Reagan policies and dragged Bill Clinton along with them. Clinton has taken credit for the successes of the 90s that can all be tracked back to reimplementation of Reagan's policies (and the Republicans have mostly allowed him to do it because the current GOP is controlled by Reagan haters). Once we saw Hillary become a senator followed by Secretary of State, we saw that she hadn't learned a thing and was sticking to her old progressive Alinsky ways. With this she wants to bring her phony feminism (her feminism makes women weaker) and her political correctness into full power if she's elected president. We all know that would be a disaster for many reasons. The Supreme Court nominations alone would be enough to push America into the thousand years of darkness that Reagan warned about. Let's take a look at these. First, she will appoint women to half her cabinet posts. Now there will be plenty of reaction to that, but it's clearly the typical left wing attempt to win female votes because of it. It's no different than people claiming that Hillary should be president because she's a woman. It's absolute nonsense. The fact is that people who lead our nation, including their cabinet members, should be the best people for the job and gender, race, religion, or anything else should not be a criteria. 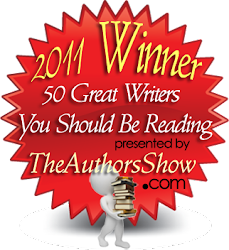 No thinking person would disagree with the fact that there are talented people of all kinds. When you own a business and want to succeed, you hire the best person for the job, not the person who fits some politically correct requirement, which is all this is. Just because you're a specific gender does not mean you are qualified to hold a position. I've seen it in business where people were hired because of some politically correct reason. Better people were passed on for the job because they did not meet the proper politically correct qualification. Why would we want someone who's going to put political correctness over hiring the best person for the job? It would be stupid for the American people to elect someone who would do this. Second, she wants to revive immigration reform with a path to citizenship. The majority of Americans have made it clear they want our borders and immigration brought under control. This, once again, is pandering for votes. Hillary hopes to win the votes of people who have family and friends they'd like to see be given citizenship for their law breaking. What she really wants is the votes of the illegal immigrants who are in America. The Democrats have announced that their platform includes no longer requiring learning English to become a citizen. The fact that someone broke the law means nothing to them (probably because abiding by the law is not something Democrats are known for). But going beyond that, this even affects legal immigrants. The Democrats don't care about the destruction of our culture. They don't care that requiring assimilation is important so that America maintains its strength and individuality among nations. No, all the Democrats, with Hillary in the lead, want is to have the power in this country regardless of the consequences to the nation. Third, she wants to push a $275 billion infrastructure/jobs plan. She wants to increase the budget by $1.4 trillion and increase taxes by $1.2 trillion, too. We already know that when the Democrats spend money for infrastructure to "create jobs" that it never works. Can anyone name the jobs created by the TARP bailout? All this stuff boils down to is a way to reward people who supported them. Whether it's unions or politicians that did favors for them that get money to spend on their constituents, it's the same old money-grubbing politics. And notice that her increased spending is more than her tax increases? We're already spending more money than we bring in. Our nation is technically bankrupt with more debt than any nation in history and yet over 40 cents of every dollar Congress spends is additional debt that we cannot sustain. This is a good example of the difference between a businessman who knows how to run things efficiently and a politician who only knows how to spend. Trump talks about cutting waste, creating more efficient systems, and getting our national budget to be efficient. As a businessman he knows you can't spend your way to prosperity. He also knows that we are a hair's breadth from financial collapse if something isn't done soon. Hillary just wants to spend. Fourth, she wants to seek common ground with the GOP over drinks. She doesn't play golf, so she wants to go back to the way politicians in the past have done things where sit around after hours drinking and talking. While that may sound nice to some (Personally I never like the thought of alcohol being anywhere near important decisions, but that's not even my point here.) Our problems are not a matter of just changing the way things are discussed and negotiated. They are a matter knowing how to negotiate and our politicians have proven that they don't know how. What we need is someone who has American's best interest as their priority, not just making a deal with a buddy in politics. Hillary is trying to get people to believe that "getting along" (sounds like Obama, doesn't it?) is what we need. Any successful businessman knows that they don't have to get along with someone to do business with them. This isn't about being liked. It's about successful negotiation. And it appears that the only successful negotiation Hillary's ever been good at is getting people to pay her and her foundation big bucks in return for political access and favors. When the article says that Hillary wants to break up the gridlock in Washington I am sure that all she means by that is that she wants total control and no one to challenge her. With the Senate and House Republicans we have in office now (of which most will be reelected, so there will be no change in Republican leadership in Congress) she should have smooth sailing just like Obama has had. After all, the Republicans have done nothing but rubber stamp virtually everything he's wanted to do. Fifth, if the GOP blocks her she'll use executive actions. So, if she can't the parties to work together, then she'll resort to executive actions. In other words, more Executive Orders just like Obama has used to skirt Congress and the law. This is the mindset of tyrannical leaders. And with Hillary we'd just be exchanging one for the other. The only difference is that Obama has already laid the groundwork so that Hillary would not be starting from scratch. She could go further and do it faster in destroying our nation and that should be what concerns voters.